For the last few years, the Toronto-based filmmaker Sofia Bohdanowicz has been busy honing her craft. She’s released several short films, including a poetic trilogy about her paternal grandmother and her first feature film, Never Eat Alone, a sublime, fictionalized account of her maternal grandmother’s acting career. In the process, Bohdanowicz has discovered the beauty of the creative process itself — and that improvisatory spirit has come to define her filmmaking style. But it was a lesson hard-learned. While travelling in Europe, Bohdanowicz accompanied a friend on the road to film the countryside for a project. “At the time it sounded like a good idea,” she says. But the day turned out to be a disaster, with miserable weather, unusable footage and constant bickering threatening to ruin her film. She kept this mentality in mind when making her sophomore film, Maison du Bonheur, now playing at Hot Docs. The film is about Juliane Sellam, a 77-year-old, French, widowed astrologist whom Bohdanowicz had never met but had discovered through a co-worker (Sellam’s Toronto-based daughter). After Sellam checked her astrology charts, she gave Bohdanowicz the OK to come stay at her beautiful Montmartre apartment to shoot her life story. And so Bohdanowicz did. She bought 30 rolls of old film stock with a bank loan and showed up on Sellam’s doorstep with a bouquet of flowers. “At first I was like, ‘Maybe this is naive,’ but I was just ready to do it and see whatever came out of it,” she says. 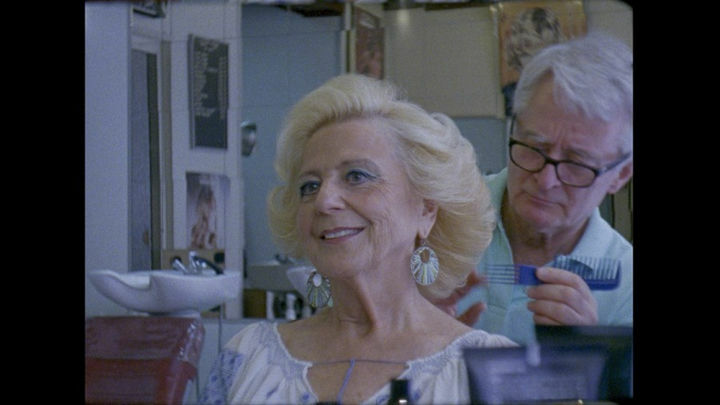 Sellam is a mesmerizing documentary subject, and Maison du Bonheur is a fascinating character study of a person whose positive outlook on life has endured for 70-odd years. The film is a disarming, romantic vision of the small moments that define a life. It’s also a rare representation of the elderly that challenges the notion that one must turn grumpy and grey in old age. Sellam’s happiness is very much rooted in her rituals, like her meticulous daily makeup routine, her hair salon visits (she still dyes her hair blonde and has had the same stylist for 30 years) and her rose gardening. She was impressed that Sellam was so open to the idea of a total stranger coming into her apartment to film her life. Because Bohdanowicz is essentially a one-woman film crew, she says that sometimes people don’t necessarily understand that she’s making a “real” film. Keeping equipment and crew to a minimum allows Bohdanowicz to keep costs low — she applies for grants after she’s made films, not before — and this gives her the utmost creative control over her craft. “I think the work is better for it,” she says. In addition to starting an M.F.A. at York University this autumn, she has two new films on the slate, and will again work with Toronto actress Deragh Campbell (who stars in the aforementioned Never Eat Alone). The new films the two are working on will explore more of Bohdanowicz’s family history — one about a female violinist who served as her grandfather’s mentor, and another about her great-grandmother, whose secret love letters to a poet in New York spanning a two-decade span were recently discovered. “I love the idea of archives and nostalgia,” she says, citing the film The Dreamed Ones — about a letter exchange between two poets — as an influence on her own work. Another one of her biggest inspirations is Chantal Akerman, whose rich filmography also explored her family’s history. Bohdanowicz had to recently explain why she keeps working through the same themes in her films during an application when asked how her upcoming films will differ from previous work. For her, exploring the same themes is a way to refine her creative vision. Originally published May 5, 2017, on CBC Arts.